The confirmation program for 6th through 8th graders challenges young people to grow in faith, deepen friendships, and experience service opportunities. Confirmation Ministry is a 3-year process which usually begins in 6th grade, but older students are welcome too. Confirmation meets Wednesdays from 6:30 to 8:00 in Agape through the school year. Other servant and fellowship events and at least one retreat will be held during the year. We will also have a couple of field trips where we visit other faith communities. 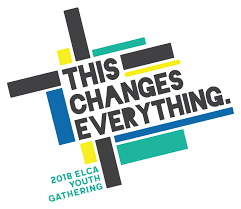 We have a group going to the 2018 ELCA Youth Gathering. Four of our high school students and two adults will be traveling to Houston in June to take part in this life-changing experience. They need our help to get there, though. Click on the button below if you’d like to donate to help them reach their goal. These are in the planning stages.